I saw a clip of that Channel 5 documentary the other day which claimed Michael solely approached Epic records and essentially brokered the deal which led to the Jackson 5 leaving Motown, unbeknownst to Joe or the brothers. I hadn't heard this before and given the source I remain highly suspicious. Does anyone have more information about this period? I can only recall Michael approaching Berry Gordy at age 16, demanding they be granted creative freedom. He did that without talking it over with his father/brothers first. He wrote about it in his book. He described himself as a lion that day! Do you have a link to this documentary? What was the name of the documentary? I want to look it up. I can't recall any meeting prior to signing with cbs though..
Back in the day, I always read that it was Joseph that was fed up with Motown not giving his kids more creative control and negotiated with Epic. (After Michael talked to Berry). He was premature and signed and announced it before the Motown contract was done. So Berry sued, kept their name, and made them pay recording costs for unreleased music. Berry and CBS were in a fight for several years too. Michael and Joseph together had a talk with the CBS execs after the first 2 albums and they let them do Destiny. Kind of a last chance. This is more along the lines of what I understood. 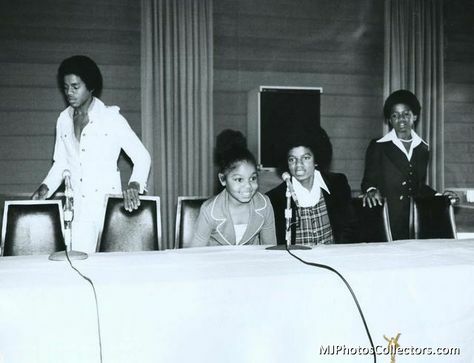 The Jackson family announced their decision to leave Motown at a press conference in the Rainbow Grill. For the conference, ten high-backed black chairs were arranged behind a long, narrow table on a dais; dozens of other high-backed black chairs were arranged to face the dais. “We left Motown because we look forward to selling a lot of albums,” Tito Jackson answered. “Motown sells a lot of singles. Epic sells a lot of albums,” Mr. Jackson added. I’m sure the promotion will be stronger,” Michael Jackson said. A reporter did ask if the Jacksons had tried to renegotiate their contract with Motown. with the Jacksons we will probably never know the exact details.. They all tell stories to make themselves sound important and like they played a role in big smart moves and Michael did a lot around that time to protect the family image.. Thus! reality and myth become foggy! What does Michael say specifically about it in Moonwalk? Still, '84 would have been too early for a follow up. 'Thriller' was still riding high. Yup... Thriller did so well they were able to string it along on the charts and with public attention for a few good years..